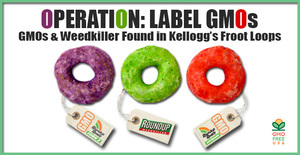 UNIONVILLE, C.T., Jan. 29 /CSRwire/ - GMO Free USA today published the results of independent lab testing which documented that Kellogg’s Froot Loops cereal contains high levels of insecticide-producing genetically engineered corn that is regulated by the EPA. Tests also documented the presence of glyphosate, the main chemical ingredient of Roundup® weedkiller. The public interest nonprofit recently launched “OPERATION: LABEL GMOs” to test popular food products for genetically engineered ingredients (GMOs) and glyphosate, which is heavily sprayed on GMO crops. There is substantial and growing peer-reviewed scientific evidence that both GMOs and glyphosate are damaging to health (see supplementary information below). GMO Free USA plans to expand testing to include 2,4-D, dicamba, atrazine, and neonicotinoid insecticides. The agrichemical corporations that produce GMOs, together with Big Food, have spent millions of dollars in recent years to narrowly defeat citizens’ ballot initiatives for mandatory GMO food labeling in California, Washington, Oregon and Colorado. Kellogg’s alone has spent nearly $2 million to fund anti-labeling efforts. “We find it disturbing that Kellogg’s is feeding children unlabeled GMOs and toxic herbicides. Statistics show that this is the first generation of children that are sicker than their parents. Is Kellogg’s endangering our children? Based on the growing body of scientific evidence, we believe so and we hold Kellogg’s accountable. Parents need to know what they’re feeding their children, and Kellogg’s is spending millions to keep the composition of their products hidden,” says Diana Reeves, Executive Director of GMO Free USA and mother of 3. Reeves echoes the sentiment of a rapidly growing movement in the U.S. that is demanding the removal of GMOs from the food supply and the reduction of pesticide use in agriculture. The FDA, EPA, and USDA allowed the insecticidal GMO corn and the glyphosate discovered in Froot Loops to be commercialized without ever conducting human safety tests. An in-vitro study found that the insecticides in this corn may be toxic to human cells. Feeding studies conducted on mammals found adverse effects, including immune system disturbances, signs of organ toxicity, disturbances in the functioning of the digestive system and male reproductive organ damage. The level of glyphosate detected could kill beneficial gut flora as documented by a study on chickens. An in-vitro study on human cells at minute real-world environmental levels of exposure found that glyphosate was able to effectively substitute for estrogen in stimulating growth of hormone-dependent human breast cancer cells. Several studies also suggest that glyphosate bioaccumulates in our bodies. Glyphosate was found in breast milk in recent tests. All of this research raises red flags that Kellogg’s and the FDA have ignored. Despite testing for hundreds of pesticides in food commodities, the USDA claims they do not test for glyphosate residue. Why would the USDA not test for residue of the most widely used agricultural herbicide in the world?